Echo of Moscow (Russian: Э́хо Москвы́, Ekho Moskvy) is a 24/7 commercial Russian radio station based in Moscow. It broadcasts in many Russian cities, some of the former Soviet republics (through partnerships with local radio stations), and via the Internet. The current editor-in-chief is Alexei Venediktov. Echo of Moscow became famous during the events of 1991 Soviet coup d'état attempt - it was one of the few news outlets that spoke against the State Committee on the State of Emergency. The Committee's decree number 3 on the suspension of Echo's broadcast is now regarded as a prestigious state award by the station's journalists. According to editor-in-chief Alexei Venediktov, the special KGB Alfa group made several attempts to cut the radio's access to the transmitter, but its employees managed to connect the studio directly to the transmitter through the telephone line and continue broadcasting. From the first day of its existence Echo of Moscow adhered to one rule: «All significant points of view about events should be presented». Journalists have been jokingly calling the station «Ear of Moscow». Most of Echo of Moscow's content consists of news and talk shows focusing on social and political issues, where the station tries to represent different points of view. Alexey Venediktov has been the station's chief editor since 1998. Radio hosts of the station include Victor Shenderovich, Yulia Latynina, Sergey Parkhomenko, Alexander Nevzorov, Yevgenia Albats, Vladimir Kara-Murza, Vladimir Ryzhkov, Yevgeny Yasin and Sophie Shevardnadze. As of April 2014[update] Yulia Latynina is the most popular presenter at the radio station. In addition to broadcasting, Echo of Moscow runs a website that publishes analytical and factual materials in a variety of fields including international and domestic political affairs, social developments and cultural trends. The articles are written by well-known political analysts, academic researchers, columnists and public figures. Among the website's authors are Dmitrii Bykov, Matvey Ganapolsky, Alexey Navalny, Victor Shenderovich, and a number of others, who have sustained national and international acclaim in their areas of expertise. The Echo of Moscow site is an authoritative source of information, and its publications are regularly cited, relied on and reproduced by major Russian internet publications and other media sources. As of 2018 Echo of Moscow is majority owned by Gazprom Media which holds 66% of its shares, the remaining 34% are held by journalist staff. Approximately 900,000 people in Moscow and 1,8 million in other Russian regions listen to Echo of Moscow daily. According to TNS Global (Moscow, summer 2011), the most common listeners are middle class and upper middle class Russians 40 years and older with a higher education, residing in the city of Moscow. They make up one third of the total listeners of the radio station. The radio's programs can also be streamed online and are available in text, audio and video formats at the station's website. The website itself attracts an average of 700.000 visitors daily. In October 2017, the station was broken into by an assailant who pepper-sprayed a security guard and soon afterwards stabbed Tatyana Felgengauer, one of Echo's top presenters, in the neck. Her injuries were life-threatening, but she was able to make a full recovery thanks to timely medical intervention. The station described the attacker as an Israeli, quoting "informed sources". Forensic medical expertise determined him to be a paranoid schizophrenic, and he was sentenced to compulsory medical treatment by the court. In September 2009, numerous chief editor replies point out that Gazprom and/or other stock-holders did not interfere with informational policy and were not allowed to. On 1 November 2014, the station received an official Roskomnadzor warning that a program the station had aired about Ukraine contained "information justifying war crimes". A radio station can be closed down if it receives two Roskomnadzor warnings in one year. Wikimedia Commons has media related to Echo of Moscow. ^ "Постановление N 3". 1991-08-26. Retrieved 2018-07-31. ^ ""Эху Москвы" исполнилось 25 лет". Interfax.ru (in Russian). 2015-08-22. Retrieved 2018-07-31. ^ "Топы". Echo of Moscow. 24 April 2014. ^ "Венедиктов покинул совет директоров "Эха Москвы". Оказалось, что Путин знал о радиостанции больше него". BBC News Русская служба. 2018-07-30. Retrieved 2018-07-31. ^ "Russia radio presenter stabbed in neck". BBC News. Retrieved 23 October 2017. ^ "Напавшего на Фельгенгауэр отправили на принудительное лечение". Радио Свобода (in Russian). Retrieved 2018-07-31. 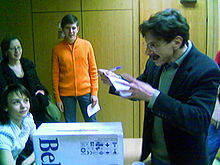 ^ Juferova, Yadviga (2008-02-20). Свобода эха. Останется ли после 2 марта Алексей Венедиктов главным редактором "Эха Москвы"? (in Russian). Rossiyskaya Gazeta. Retrieved 2009-09-09. 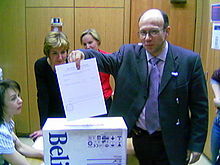 ^ Alexey Venediktov (2008-03-03). Без посредников (Podcast) (in Russian). Echo of Moscow. Retrieved 2009-06-13. ^ a b "Russia's Ekho Moskvy Hit With Official Warning". Radio Free Europe/Radio Liberty. 1 November 2014.